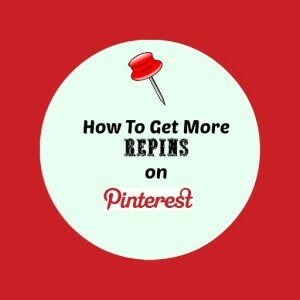 What makes a pin get numerous repins on Pinterest? Is there a formula or concept that one should follow in order to try and get more repins? It isn’t an exact science but analysing some popular pins does give plenty of tips for successful pinning. Curalate put hours of research into determining which was the most popular image on Pinterest. They concluded that this image was the most successful pin ever with 307,000 repins, 300 comments and 8,000 likes. Not bad for a little bowl of salad in a close up photograph! As you can see, this particular image is portrait, the background doesn’t take from the main image and there is one dominant item. 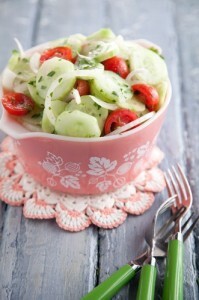 It is of a healthy snack and food tends to do very well on Pinterest. It contains the complementary colours of reds and pinks with various shades of green (opposite sides of the colour wheel so they naturally complement each other. It’s a simple yet extremely effective photograph and yet, it can easily be emulated with products from your own business. I’ve selected three popular pins from the popular section on Pinterest (just click the top left button on the main gallery page and select the ‘popular’ category). This section is updated frequently so do keep an eye on it for examples of pins in your subject area so you can analyse them and try to emulate their success with your own images on your website. 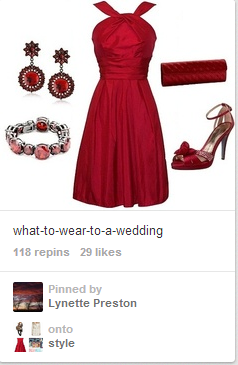 This red outfit for a wedding is popular for many reasons. As mentioned above, colours from the red spectrum tend to be popular so it ticks that criteria. The background is plain and the suggested outfit comes complete with accessories.It’s in portrait style and everything needed for the complete outfit is provided. Every fashion retailer should be creating pins like this using the Polyvore tool. Not only can they showcase their clothing and accessories for sale, it would also be easy to create a blog post about this image and demonstrate their knowledge in helping ladies to create a complete outfit for little effort. As with all businesses, fashion retailers need to be adding value to their sales and people would be inclined to purchase the accessories as well as the outfit and shoes in this instance. The description provides information and makes it clear that these are for a wedding. However, it could be improved by incorporating the keywords ‘wedding clothes’ or ‘wedding outfit’ too. 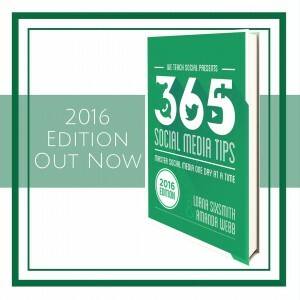 If it links to a blog post, it could be improved by stating that there are more tips available e.g. 5 Tips on how to wear red to a wedding. Simple text such as ‘Wedding Outfit Suggestions’ or even the full ‘What to wear to a wedding’ on the image would improve it too. Or how about a play on the song ‘Lady in Red’ as the text? What do you think? 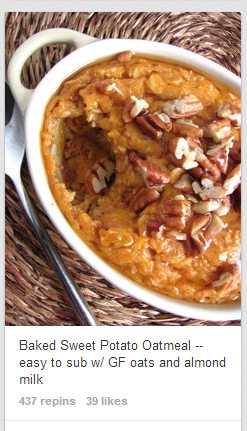 Food images often work well on Pinterest and this one ticks all the boxes of being a close up of a baked dish. The background is clear and doesn’t detract from the main item. The fact a spoonful has been removed suggests it is tasty. Personally speaking, I don’t think it looks that atttractive but yet it works. Perhaps it is the orangey colours that have encouraged its popularity. It is clear the recipe is available once the image is clicked too. People are always looking for one-pot type dishes and by stating that this can be altered to cater for gluten free or dairy free diets too, makes it a winner. Another food based image but I wanted to share a Hallow’een / Autumn pin with you and this one ticked all the boxes. The orange of the little cheesecakes, particularly sandwiched between the white cream and the brown biscuit base, placed on the crisp white plate, is visually attractive. The pumpkins in the background don’t detract from the main image but do make the main ingredients clear and ensures the people will repin this to Hallow’een boards as well as to recipe and food boards. It’s evident that the recipe will be available when the image is clicked. The description could be improved by adding the hashtag with hallow’een or simply saying ‘Mini pumpkin cheesecakes – bakes these for Hallow’een’. 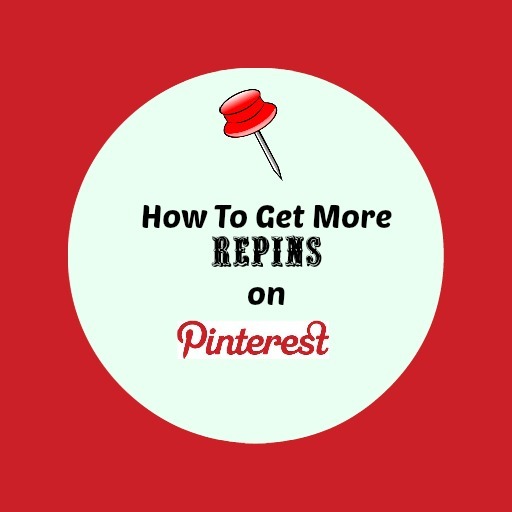 A simple call to action can make all the difference to a pin being repinned. 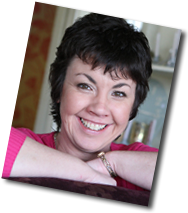 If you would like to learn how to use Pinterest more effectively for your business, do check out our Advanced Pinterest course which is delivered online over 5 weeks. Thanks for the amazing post and great tips. But, I wonder if you have tried our Pinterest tool called Pinwoot. 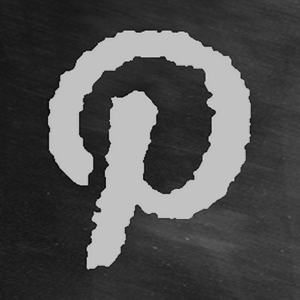 Its a free tool and one of its kind tool to help you grow your Pinterest reach and engagement. I think you must give this link a look : https://pinwoot.com/blog/2013/06/02/how-to-get-100s-of-likes-and-repins-for-your-pinterest-pins-with-pinwoot/ to see how easy it is to grow your Pin’s repins and likes using Pinwoot. Hope you will find Pinwoot useful.